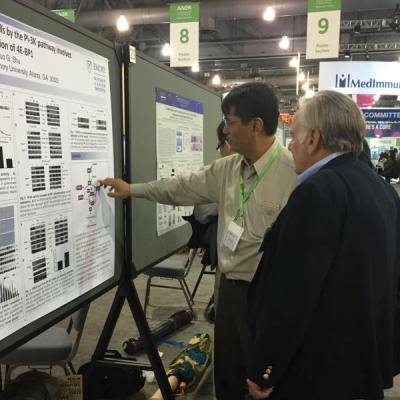 Winship investigators are among the featured speakers at the 2016 American Association for Cancer Research (AACR) Annual Meeting, from April 16-20 in New Orleans. And more than a dozen Winship researchers are contributing to the multidisciplinary program at this important annual meeting by presenting research papers and posters on topics that include mechanisms of drug resistance, experimental and molecular therapeutics, radiation oncology, biomarkers, and immuno-oncology. As part of a panel discussion on Sunday about advances in understanding the genomics of multiple myeloma, Sagar Lonial, MD will describe novel state-of-the-art therapies for newly diagnosed patients. Suresh S. Ramalingam, MD is an invited speaker for a regulatory science and policy session, "New Drugs: A Review of Recent Breakthrough Therapies," that will take place on Tuesday, April 19. A visually compelling microscopy image made by Winship researchers Adam Marcus, PhD and Scott Wilkinson will be featured in a special National Cancer Institute "Cancer Close Up" project that will be on display throughout the AACR meeting. Their image, Cytoskeletal Proteins, is one of 24 microscopy images chosen to be in the display from nearly 100 submissions. View gallery of selected images. The theme of this year's meeting is "Delivering Cures Through Cancer Science." The program includes more than 6,000 proffered papers from researchers around the world and covers basic, translational, clinical, and prevention studies. View a schedule of lead author presentations by Winship members.